It may only be the first day of summer, but it’s already white-hot around here. Especially as the perfectly pale dress selections from Mac Duggal catch the eye of the summer party-goer. Summer is a busy time of year for weddings, with an estimated one-third of all U.S. weddings taking place during the summertime months. But a new trend these days is to have more than one gown for your big day. While many women still opt for a formal gown for the wedding ceremony, it’s becoming more and more common for the high-end bride to swap the long train and layers for a sleeker number for the reception. Not only can it make it a little easier to get down on the dance floor, it’s a great excuse to buy two gorgeous dresses! The options are endless if you want to swap your formal gown for a party frock. Look sassy and ready to dance in a frilly cocktail dress, style 64589, or a fun high-low dress, style 6089. Or keep the regal bridal look with a slightly less formal gown, such as this one shoulder glam dress, style 64518, or this gorgeous trumpet gown with tulle overlay, style 50107. Shine on the dance floor with sparkling embellishments, such as this fully sequined one shoulder gown, style 3389, or this stunning empire gown with a stoned bustier and sunburst rhinestone detail, style 61207. “It’s a great option for brides drawn to different dress styles, giving them an opportunity to showcase both of their wedding day looks,” Poulos noted. There’s certainly no requirement to change into a less formal gown, but if you want to, the possibilities are sure to excite! Wear what you love, just make sure to remember to take all the pictures you want in your first gown before changing. No one wants to have to change over and over on her wedding day! And keep the guests in mind when it’s time to swap gowns. But white isn’t only for the “I do” crowd. Wearing a white gown can help you stand out and shine at any social occasion. Not sure about pure white? You can choose another shade of pale. Dazzle on the red carpet with a sparkling mermaid dress, such as style 85144, impress at a grand gala in a gorgeous ball gown, like style 61162, or hit the dance floor at homecoming in a short, sassy number, like style 64590. Embrace shades like these fabulous nudes. Styles 3754 and 78439 will wow the crowd at a black tie event. Be camera-ready in shades of silver like style 78825, striking embellishments that pop like style 61412, or a champagne dream like style 80236. Or show off your spunky side with daring cutouts or sharp lines, like styles 70000 and 70002. 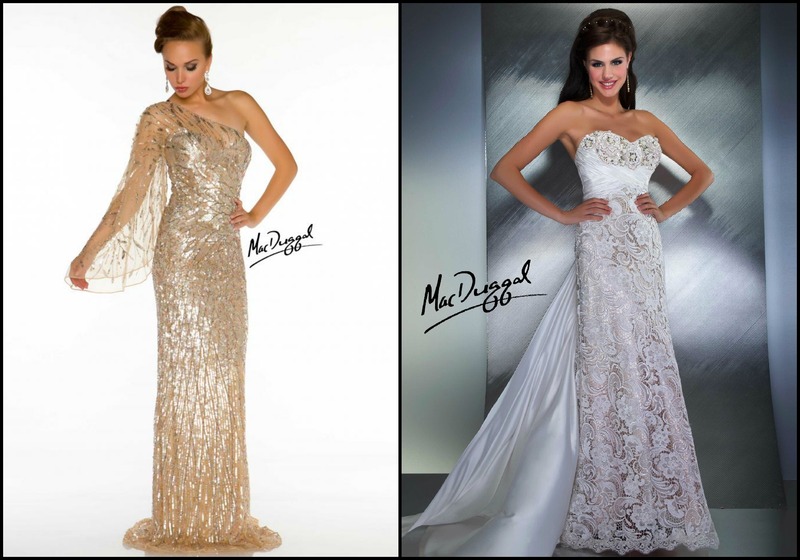 Mac Duggal designs are fit for any formal occasion, and whites aren’t stuck in the bridal section. 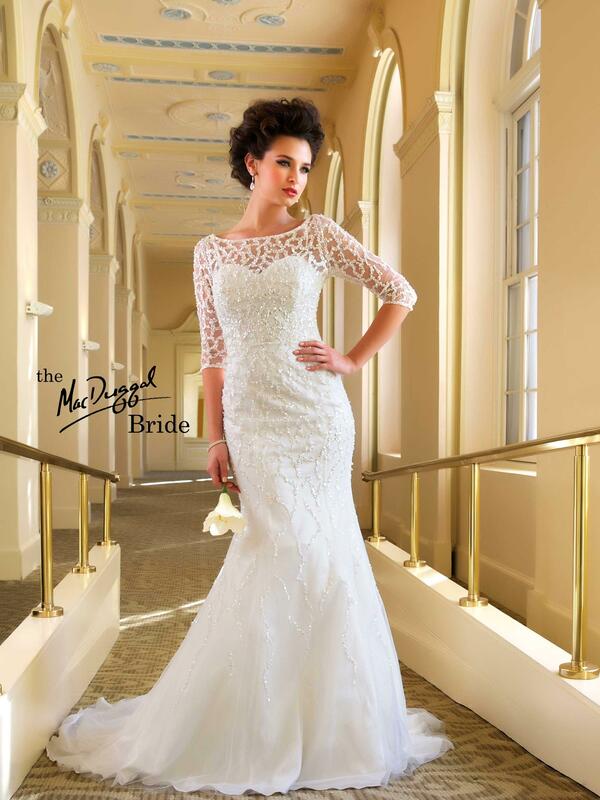 This summer, love the clean, soft, brilliant whites of Mac Duggal. Which whites strike your passion?